Tools for binding unwanted God Spawn. Lord Merrylin believed that the universe was incredibly old, and in many forms, had existed as a facet of a much larger, indeed infinitely larger lattice of universes, known as the multiverse, and that perhaps universes had existed before and would subsequently exist after our own, perhaps, if not that, then all universes would eventually slip into a state of lightlessness, the cold vacuum of entropy, that in its present state the universe was an elaborate array of energy and matter, the result of cause and effect, physical forces immense and cruel and splendid and beautiful, and indeed devoid of any supernatural quality. The other line of thought that did not betray the first was the idea of ancient thinking entities, the oldest intelligences that were perhaps born of previous universes or existences, older than stars, who had lived a billion billion millenia before we crawled from the amniotic muck. He spared not a single thought on the ideas of benevolent, caring gods or the evil of demons, yet had a healthy fear of other such ideograms. he recognised the old testament deity for its hateful arrogance, vengeful blood lust only sated by death and destruction. He saw those gods in the Pnakotic manuscripts, the Unaussprechlichen Kulten, and other such shunned, yet ultimately more truthful texts that depicted trillion year old cosmic entities whose endless unlife had made them mad, powerful and extremely tetchy. Despite his healthy understanding of what was possible within the constrains of the universal laws, Merrylin knew a thing or two about such entities. Through his research both ancient and indeed modern and learned, Merrylin respected and attempted to converse with such manifestations via mechanical means, and of course, through cruder, less reliable avenues. His understanding was that constructing convoluted belief systems around entities that cared little for corporeal beings, (and even less for idiotic corporeal beings trying to find a sense of purpose in an ultimately pointless universe by making up things), would lead to nothing good. To this end, he kept an eye on those who might inadvertently upset the careful equilibrium between the real, and the insubstantial darkness beyond the veil of our universe. The Order of the Golden Dawn, passing acquaintance of Alastair Crowley, were foreshadowed by lesser known sects of occultist and black magik covens. It was in the wealthy homes of the aristocracy and indeed the Monarchy of the United Kingdom that Merrylin was most wary of. He was a wealthy man himself, yet held particularly anti establishment ideologies. The Flaxen sun, Or Flaxen Dawn worshippers were introduced to him by his Father when he was a child. He would observe his fathers dubious engagements, peering through the banister at the rituals performed at Merrylin House. 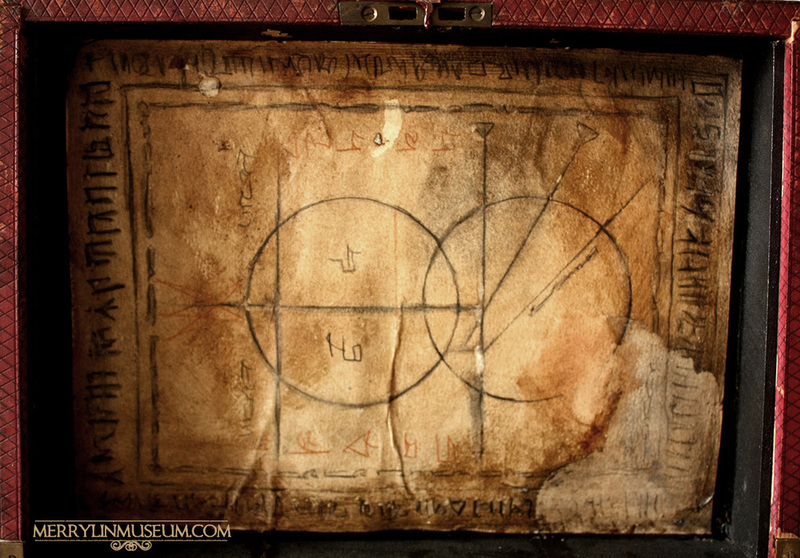 Here he would see acts of clairvoyance, sacrifice and summonings, all of which would scare and ultimately anger Thomas, as he grew to understand the mechanisms of both fraudulent and genuinely dangerous esoteric magic. he would take it upon himself to police these acts in later life. Through his contacts he became aware that a certain heir to the throne intended to murder family whose claim to the crown would fruit before him. After some research, Merrylin found the nest of the Flaxen Dawn, a stately home on the outskirts of Berkenshire. At once he took a handsome cab to the foreboding establishment, tracing a path through dense thicket until the alluring glow of candle light caught his attention. Within, the various notable men and women of royalty, those whose mouths were born with silver spoons firmly lodged in place, stood in concentric circles around a tall black altar. A woman lay upon the stygian font, legs apart, the screams of labour thick amongst the burning scented oils. Merrylin removed a box from his bag. Within were hexes, devices for sealing that which should not exist in our plane of existence. He found an open window and slid within, the chime of bells and the low throng of spoken incantations was discernible. He recognised the birthing ritual and knew their intent. Raise a fertility god, invoke her through a living human, force her to give birth to some small pestilential god spawn. Use God spawn for unspeakable acts of violence. He saw the bottles of opium upon a large table; the ensemble were all enraptured. He carefully removed a pouch of soot and encircled the room with it. Once placed, using his own knowledge of quantum entanglement, he hexed the entire room. As the god spawn came forth into the world, He Leapt from the shadows and pulled the mother from the podium, dragging her free of the circle, umbilical chord still attached. Before the Flaxen Dawn occultists realised what he had done, he sealed the Hex and invoked the Cathen Howen -the rule of words, and with the flick of his hand, the entire congregation vanished, into some damned singularity within the chasm of a black hole. The God spawn was inanimate, the human mother passed out in a pool of her own blood. He separated mother from child, bound the body of the dead creature within a multitude of sealing hexes, placed it in the hexing box and tended to the woman. She regained consciousness with no understanding of what had occurred. He returned her to her home in London in the early hours and sped away with the box. 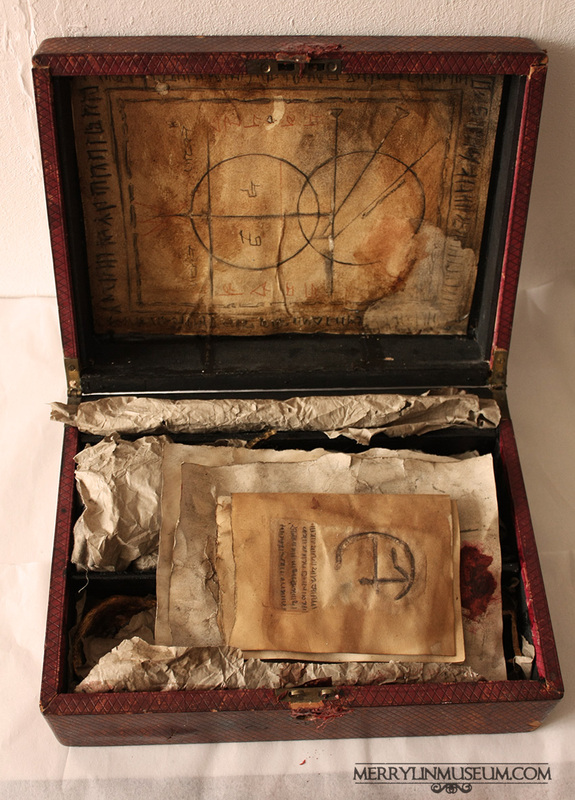 The Hexing box remained sealed until he was able to rid any niggling sinuous connections between the corpse of the child and its deific mother. 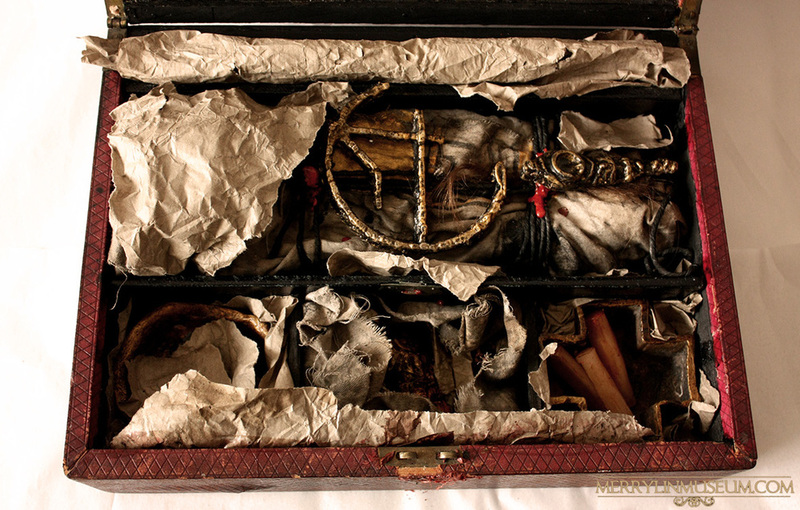 This involved a number of blood rituals, metal sigils cast to ward off unwanted eyes, effigies to watch the corpse for all time, bowls to hold his blood, which he performed himself, subduing the great behemoth beyond the breach with the various tools within the box. 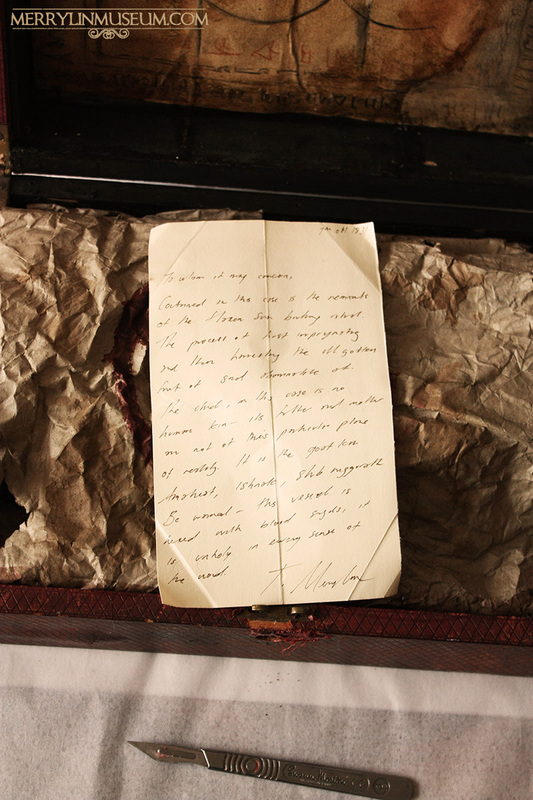 Thankfully the necrotic goddess let go of the flesh and he was able to let it rest, sealed until we uncovered it within the Merrylin Collection.